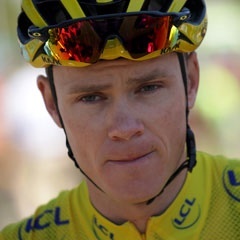 Milan - Tour de France champion Chris Froome confirmed on Wednesday he will race in next year's Giro d'Italia from Jerusalem to Rome as he targets a treble of Grand Tour wins. The 32-year-old said that it was "a whole new motivation" to go for a third consecutive Grand Tour trophy after winning both the Tour de France and Vuelta a Espana last year. "It's a unique situation for me, having won the Tour and Vuelta and now having the opportunity to go to the Giro and attempt to win a third consecutive Grand Tour," said Kenyan-born Froome, attempting to become just the seventh man to win all three Grand Tours. Froome and Team Sky have taken confidence from this season's successful Tour and Vuelta double. "We know that it would be a significant feat in the modern era, but the way we managed things this year gives me confidence that I can successfully target both races," he said. Froome would have a six-week break between the end of the Giro on May 21 and the start of the Tour on July 7 - one week longer than usual - to recover from a mountain-packed final week. Two-time Giro winner Nibali added: "He'll be one of the biggest riders to beat and so it's a huge challenge." Froome's announcement overshadowed the unveiling of the route which begins in Israel - the first time one of cycling's three major races has started outside Europe. From Israel the race heads to Italy, landing for three stages in Sicily, like last year, with a mountain finish on stage six, on Mount Etna. There are eight mountain stages - four in a testing final week beginning with the steep climb to the summit of Monte Zoncolan on stage 14 followed by three consecutive stages in the Alps.